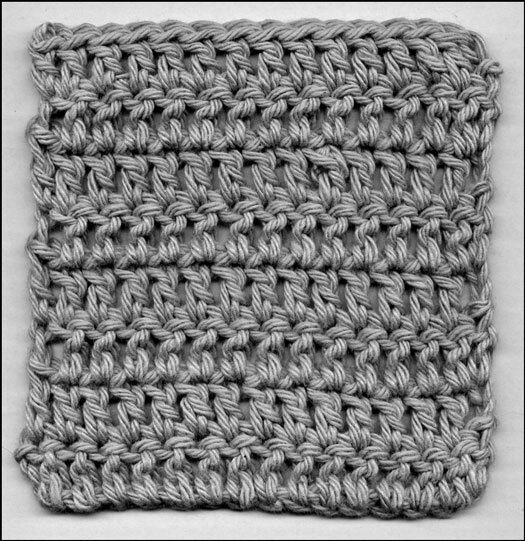 The double crochet (abbreviated dc) is one of the most common crochet stitches and is about twice as tall as a single crochet. (You can read about single crochet in How to Make a Single Crochet.) A fabric made of all double crochet stitches is fairly solid but not stiff and is great for sweaters, shawls, Afghans, placemats, or any number of other home decor items. You can also combine the double crochet stitch with other stitches to produce many interesting patterns and textures. 1. Yarn over the hook (yo), which you can read about in How to Yarn Over in Crochet. Remember to yarn over from back to front. 2. Insert your hook between the 2 front loops and under the back bump loop of the fourth chain from the hook (see Figure 1a). Figure 1: Beginning a double crochet stitch. 3. Yarn over the hook. 4. Gently pull the wrapped hook through the center of the chain stitch, carrying the wrapped yarn through the stitch. Now, you should have 3 loops on your hook (refer to Figure 1b). 5. Yarn over the hook. 6. Draw your yarn through the first 2 loops on your hook (see Figure 2a). Figure 2: Drawing your yarn through the loops. 7. Yarn over the hook. 8. Draw your yarn through the last 2 loops on the hook (refer to Figure 2b). One double crochet (dc) stitch is complete. You should have one loop remaining on your hook. To finish your first row of double crochet, work 1 double crochet stitch in each successive chain stitch across the foundation chain, beginning in the next chain of the foundation chain as Figure 3a shows. You should have 16 double crochet stitches in Row 1 (counting the turning chain as the first double crochet). Figure 3: Finishing the first row of double crochet. Take a look at Figure 3b to see what the end of the first row of double crochet looks like. 1. Turn your work so that the back side is facing you. 2. Chain 3 (ch 3; for the turning chain). 3. Yarn over the hook (yo). 4. Skipping the first stitch of the row directly below the turning chain, insert your hook in the next stitch (see Figure 4a). Figure 4b shows you the wrong place to insert your hook. Figure 4: Inserting hook for the first stitch of second row. 5. Repeat Steps 3 through 8 from the previous section in each of the next 14 double crochet (dc) stitches. Be sure to yarn over before inserting your hook in each stitch. 6. Work 1 double crochet in the top chain of the previous row’s turning chain (see Figure 5). You should have 16 double crochet stitches in Row 2 (counting the turning chain as 1 double crochet). Figure 5: Insert the hook in the top chain of the turning chain. Repeat these steps for each additional row of double crochet. Continue until you feel comfortable working this stitch. Figure 6 shows you how rows of double crochet look as a fabric. Figure 6: Several rows of double crochet. Don’t work a stitch into the first stitch of the row after the turning chain. Doing so produces an extra stitch, and if you continue to add a stitch in each row, your design gets wider and wider as it gets longer and longer. Be sure to count your stitches frequently to make sure that you haven’t inadvertently gained (or lost) any stitches along the way. Sometimes, especially when you’re working with bulky yarn or a larger than usual hook, the turning chain on a double crochet row leaves a gap at the beginning of the row. To get a neater edge, try chaining 2 instead of 3 stitches for the turning chain.